People with dementia differ in the rate with which their abilities change. But because dementia is a progressive condition, their abilities will deteriorate. Most people in the later stages of dementia need total care and usually receive this in a residential facility. Some families and carers though do choose to care for the person at home. What happens in the later stages of dementia? This can be a particularly disturbing time for family and carers as the person with dementia may fail to recognise close family members. Most people with dementia gradually lose their ability to walk, wash, dress and feed themselves. Other illnesses such as stroke or arthritis may also affect them. Eventually the person will be confined to a bed or a chair. A person with dementia will have increasing difficulty in understanding what is said or what is going on around them. They may gradually lose their speech, or repeat a few words or cry out from time to time. But continuing to communicate with them is very important. Remember, although many abilities are lost as dementia progresses, some - such as the sense of touch and ability to respond to emotions - remain. If you are caring at home for someone who is in the later stages of dementia the Aged Care Assessment Team (ACAT) can help with advice and referrals for all aspects of care. You can contact your nearest ACAT by calling the number listed in the Age Page of your telephone directory. Your doctor or hospital can also help you to contact your local ACAT. If someone is in the later stages of dementia and becomes seriously ill, there may be discussion about whether to actively treat their illness. Ways of intervening may include resuscitation after a heart attack, antibiotic treatment for pneumonia, or giving food or liquids by mouth. Sometimes the decision can only be made by a guardian (sometimes called managers or administrators) appointed by a tribunal or court. Each state and territory has different regulations but medical staff or Dementia Australia can advise you about appropriate contacts. It can be very difficult for family and carers to prepare for the end, but by thinking about it and making some plans, it may be a little easier. When someone reaches the final stages of life one of the main concerns is to ensure that they are comfortable and as pain free as possible. If you are concerned that the person with dementia may be in some pain or discomfort, discuss this with the doctor and nursing staff. The actual death of a person with dementia may be caused by another condition. They are likely to be frail towards the end. Their ability to cope with infection and other physical problems will be impaired due to the progress of dementia. In many cases death may be hastened by an acute illness such as pneumonia. Based on Later stages of dementia, Alzheimer’s Disease Society, UK. Dementia Australia provides professional staff for counselling and individual support. 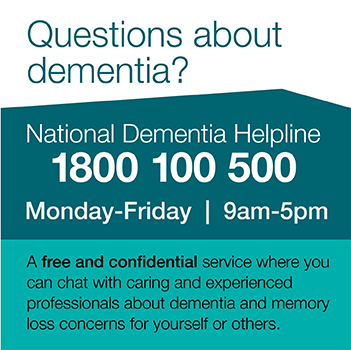 If you would like to talk about the loss of a person with dementia, contact the National Dementia Helpline on 1800 100 500. This service is confidential and sensitive.